BANGKOK: Some 80 pieces of plastic rubbish weighing eight kilograms have been found in the stomach of a whale that died in Thailand after a five-day effort to save it, marine officials say. The pilot whale was discovered early last week in a canal in the southern province of Songkhla and received treatment from a team of veterinarians. An autopsy found the bags and other plastic items in the whale's stomach. 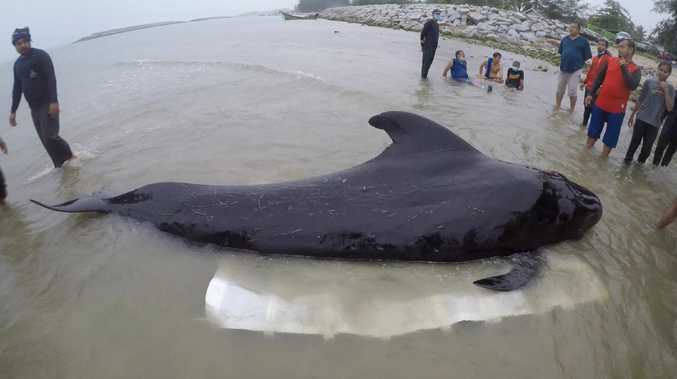 "This plastic rubbish made the whale sick and unable to hunt for food," the department said. "We will use the whale case and invite all sectors to show their intentions on how to reduce the use of plastic in Thailand," he told Reuters. Globally, eight million tonnes of plastic - bottles, packaging and other waste - are dumped into the ocean every year, killing marine life and entering the human food chain, the United Nations Environment Programme said in December. Is this the end of the yellow bin?